Dundee, a royal and parliamentary burgh and seaport town of Forfarshire, Scotland, on the left bank of the estuary of the Tay, 36 m. N. N. E. of Edinburgh; pop. in 1871, 118,974. It occupies the declivity of a hill, whose summit is 525 ft. above the level of the sea, and is rather irregularly built. The modern streets are spacious and handsome. The principal public edifices are the churches, which are very numerous, the old Gothic tower, 156 ft. high, the town hall, custom house, exchange, infirmary, lunatic asylum, industrial school, orphan institution, academy, and savings bank. In the centre of the town is a large market place, from which the principal streets diverge. Some of the docks are large and magnificent. King William's dock has an area of 6 1/4 acres, Earl Grey's of 5 1/4 acres, and the Victoria dock of 14 1/2 acres. There are also several fine quays. The manufactures of coarse linen fabrics, which employ about 25,000 hands, and of jute, exceed those of any other place in Great Britain. It has also extensive manufactures of gloves and leather. Ship building, as well of iron as of wood, is also carried on. The commerce of Dundee is very considerable. 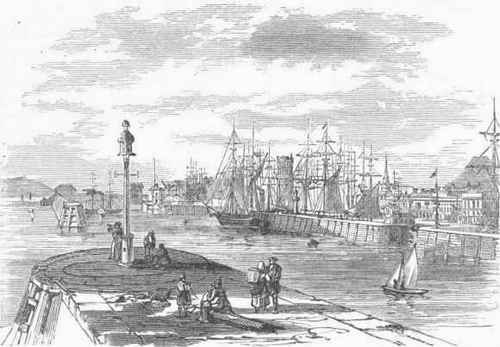 In 1871 2,559 vessels of 418,401 tons entered the port. The exports to the United States in 1871 amounted to about £1,200,000, being an increase of £200,000 over those of the preceding year. There are railway connections with Perth and Edinburgh. Dundee is governed by a provost, four bailies, a dean of guild, a treasurer, and 21 councillors. - During the reigns of the Scottish kings Dundee was one of their places of residence. At the period of the reformation it was called "the second Geneva" for its zeal in behalf of Protestantism. In 1645 it was besieged, taken, and plundered by Montrose. In 1651 it was stormed by Gen. Monk, and a sixth part of its inhabitants massacred. A splendid public park, the gift of Sir David Baxter, was presented to the people of Dundee, Sept. 9, 1862, on which occasion a statue of the donor was unveiled.